from the demands of the outside world and recharge your creativity. 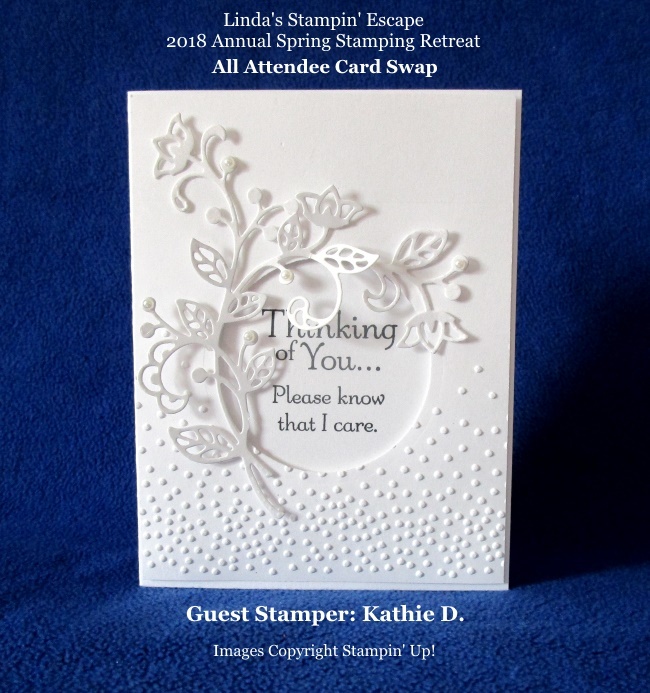 I would like to personally invite you to join me at my Annual Spring Stamping Retreat! You’ll enjoy your stay in a stunning 1930’s English Tudor Home on the shores of beautiful Green Lake. The surroundings offer a carefree setting for nurturing you and your creativity, allow you time for relaxation, and building new friendships. 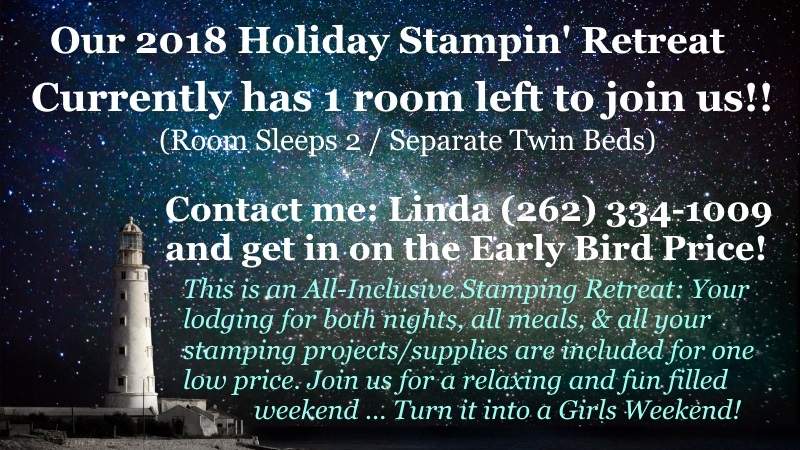 Our retreat is ALL INCLUSIVE … Your lodging, all meals and your stamping projects are all included in one low price, so you can enjoy your stay and enjoy a true relaxing getaway. is inviting, clean & comfortable. We are NOT “dorm style” so you and your friends can enjoy some well deserved “girl” time together in the comfort of a home (not hotel room). You’ll also find little surprises each night. Sit back and relax while enjoying wonderful home-cooked meals, desserts and snacks during your entire stay. 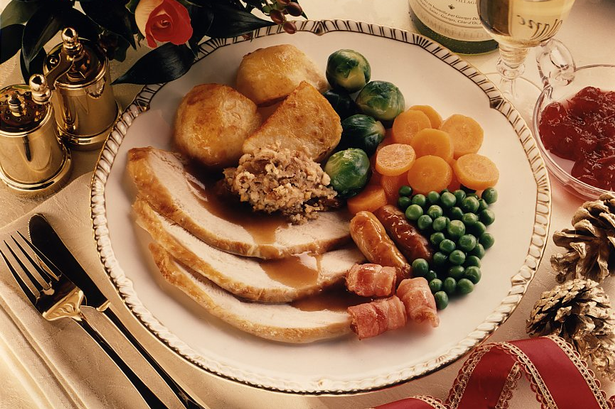 Five full meals are included… and so is the chocolate!! Coffee, tea, and bottled water are also provided throughout your stay. 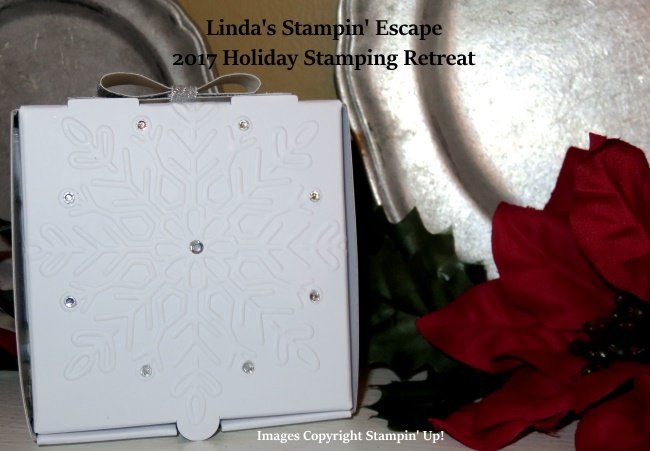 You’ll find our All Inclusive Stamping Retreats affordable and private, spacious and splendid … you will enjoy this relaxing getaway and come away with fabulous completed projects, new ideas, stamping tips, and new friendships. After Early Bird Special / Cost = $275 & Paid by March 31st. Our retreats are based on a first come, first serve basis. Only payment reserves your spot. Once received … Registration will be confirmed, and details will be sent to you; including directions, Swap Information, & More. I see you made it through Monday!! lol Me too … now we can get on with the rest of the week, and another Snowflake card!! See how my Tranquil Tide snowflakes gently fall from the top of the Pool Party cardstock? That is the stamp … nothing fancy from me!! I just fell in love with this (the other reason I bought it will be featured on tomorrows card). There is nothing lacking on the beautiful snowflake die either, especially when its cut from the new “Sparkle” Glimmer paper. If you thought the Dazzling Diamonds that retired last year was pretty … wait till you see this! The little snowflake is cut with the White Velveteen paper (Sold Out) and backed with the Joyous Noel Glimmer paper and topped off with a Clear Faceted Gem. If the layering of snowflakes didn’t add enough texture to my card … I added the Tranquil Tide Velvet Ribbon as well. 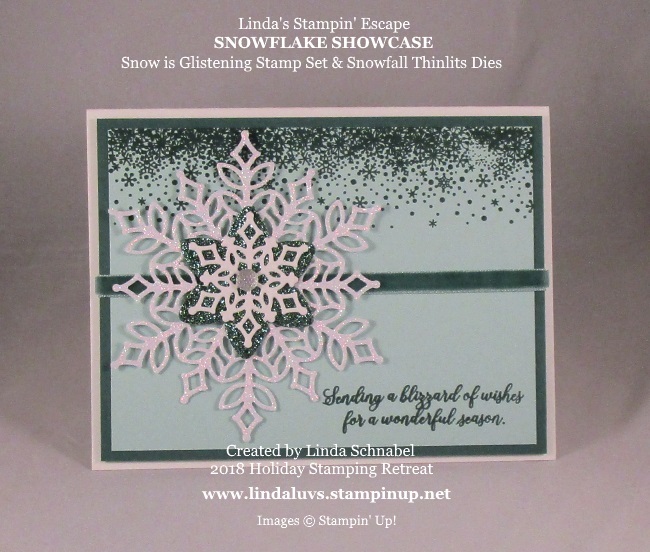 The greeting is included in the Snow is Glistening Stamp set and is stamped in Tranquil Tide. Don’t you just love this color combination!! Hope you enjoyed my Snowflake Card and that it “melts” your heart! Thank you for dropping in for a visit today! Happy Labor Day!! Hope the sun is shining where you are. We have been inundated with rain for days, so I headed down to my Stampin’ Studio (fancy word for basement craft area) and began to play with all my new goodies from the Holiday Catalog. Whenever I’m creating something with my hands, all my stress instantly melts away. It’s so satisfying. 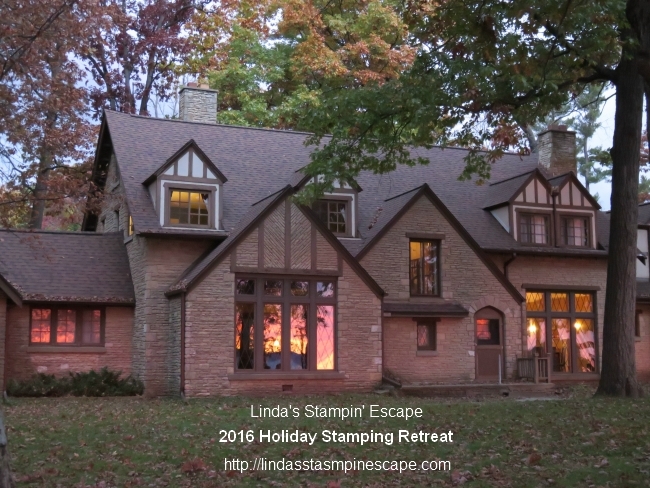 If you’re looking for that escape to melt away your stress and get some of your creative mojo going … join me at my Annual Holiday Stampin’ Retreat – November 2nd thru the 4th. I had a cancellation so we now have one room open and you are welcome to join us. This does not happen very often! Our retreat is like no other, we’re All Inclusive … just contact me and I can answer any questions you may have. 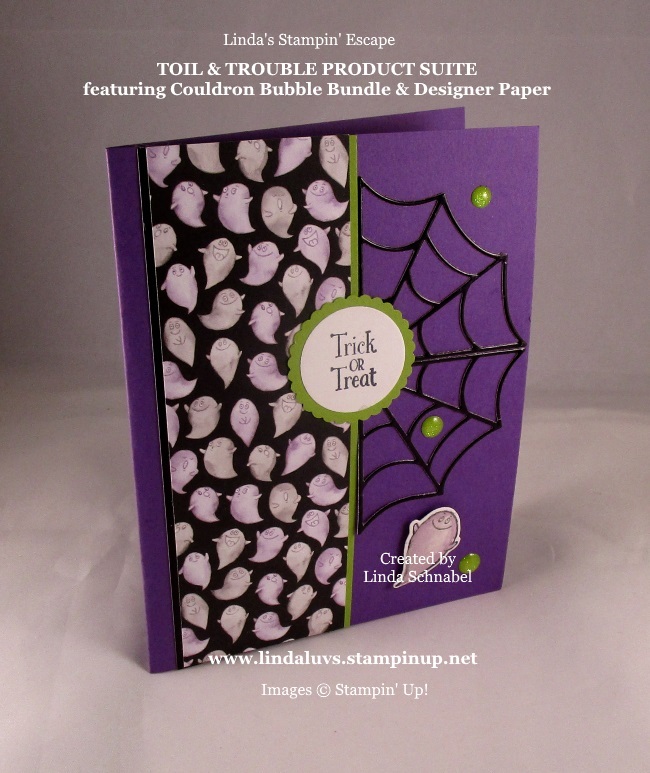 While I was in my craft room, I created a sweet -n- simple Halloween card … the Toil & Trouble product suite is really fun to work with (or should I say play). You really get a good look at the entire product suite with today’s card. I used the stamps for the ghost and greeting, used the designer paper, the dies and the “really cool” Black Foil Sheets and cardstock pack. 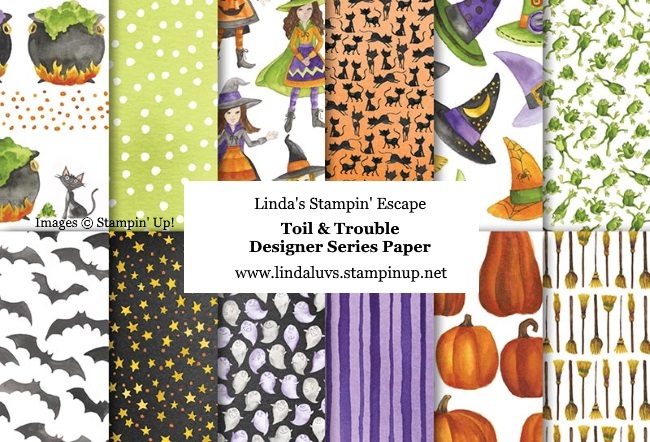 The Toil & Trouble Designer paper is so stinkin’ cute! From these friendly little ghosts, to happy frogs, hats, cauldrons, bats and more! Did you know some of the images from the designer paper can be cut out with the coordinating dies in this bundle … Fabulous! The spider webs were cut from the new Black Foil Sheets with the dies included in the bundle. I even brought out the punches: 1-1/4″ Circle and 1-3/8″ Scallop Circle to highlight my greeting. Whenever I use ghosts I have to make sure there is some ectoplasm present … lol, so you will recognize it as the Glitter Enamel Dots. I love fun, simple cards … they are easy to create and oh so fun to share. Using designer paper on your cards adds so much without all the work. You can get a better look at the products I used below. The Toil & Trouble product suite will be available for purchase on September 5th … see you then. Thank you for hanging out with me … or should I say “Ghost Hunting” on this Labor Day! Eileen and I are pleased to open our “Timeless Christmas” Holiday Stamping Retreat to you. 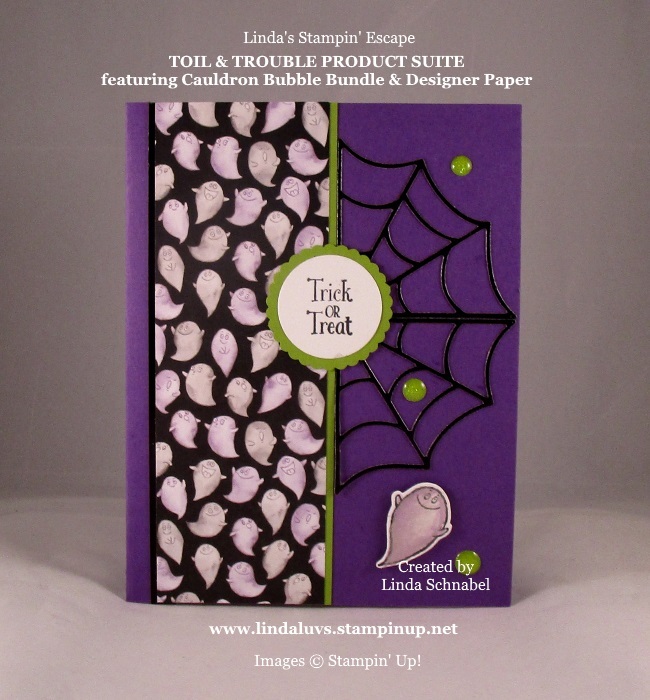 Lets get together and have fun stamping as we put a hand crafted touch on the holidays. Our years of experience and our dedication to our guests experience will ensure you an inspiring, creative, fun and memorable retreat. 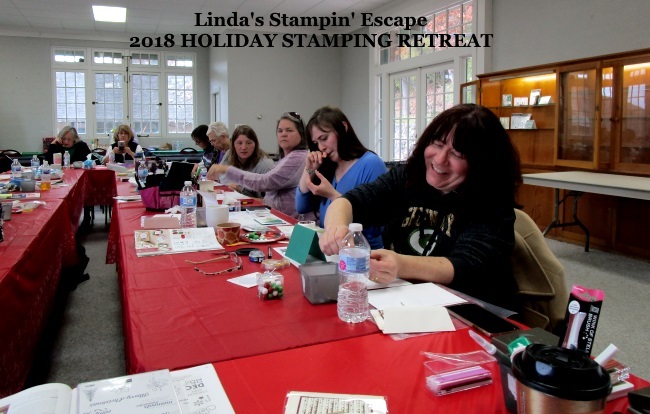 Our stamping retreats are all inclusive and include your lodging, all your meals and all your stamping projects; cut and ready for you to stamp. Along with your stamping sessions, you’ll have time to explore the beautiful grounds, or just relax by the lake… a true escape. 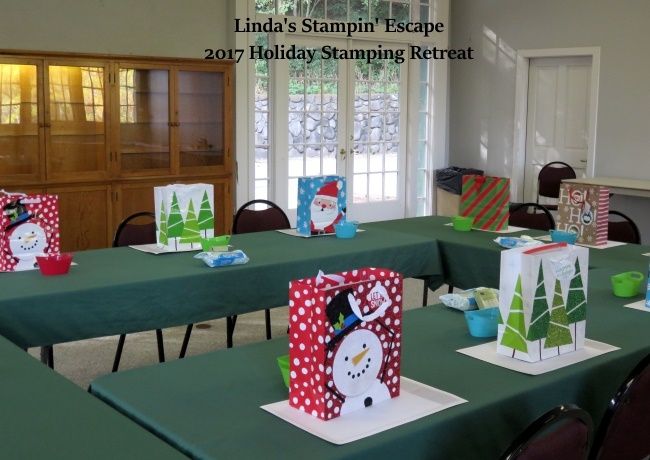 Please join us on Friday, November 2nd through Sunday, November 4th for a fun filled getaway with fellow stampers to create, make new friends, unwind, and enjoy being pampered for a weekend. 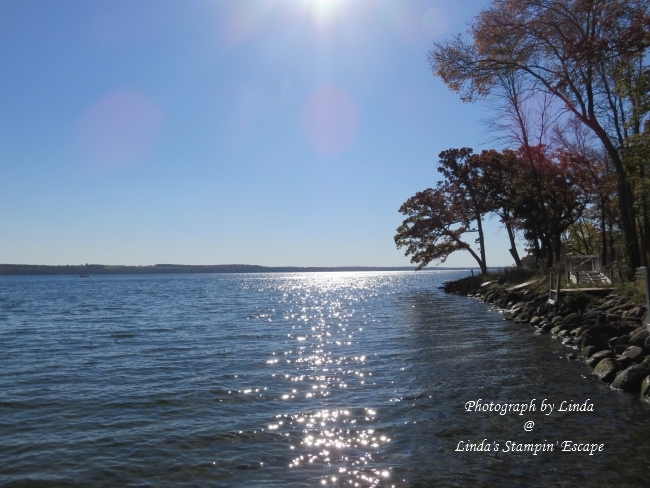 You’ll be staying in this private 1930’s English Tutor Manor situated on beautiful Green Lake. You’ll enjoy delicious home made meals prepared for you Friday night, Saturday Morning, then a fun luncheon in our stamp room Saturday afternoon, and a Continental breakfast Sunday morning. Saturday evening you’ll be treated a delicious dinner in the Bauer Dining Room… Choose a lake view or gather around the cozy fireplace. Are comfortable and relaxing. You’ll look forward to retiring each night, after a little fun of course! 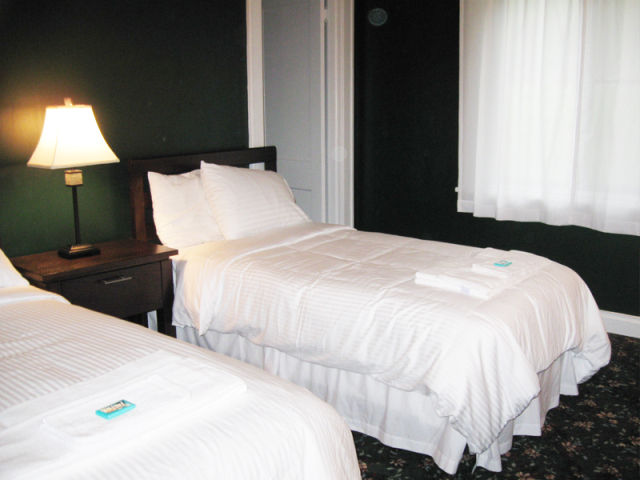 We have a large, private well-lit room with plenty of room to stamp and move around with ease! We have stations set up for die cutting and embossing. You’ll love creating in this relaxing environment and love the projects too. (Projects pre-cut for you) No worries here, you can leave your projects while your out. Registration Closes at Midnight September 30th. Our retreats are done on a first come / first serve basis … Only payment holds your spot, at which time your room will be assigned. Rooms are also based on number of guests in your party. All you need to bring are comfy clothes and your basic stamping kits: scissors, your favorite adhesive and refills, and a bone folder. If any other supplies are needed, I will contact you prior to our retreat. All stamps, inks, dies & BigShots are supplied for you. Once you are registered, I will send you an e-mail with details on our attendee swap, a brief agenda and directions to our Retreat location. I hope you consider joining us, it’s the perfect escape!! Looks like summer is upon us!! I actually had my air conditioner on yesterday and will put the second one in upstairs today!! I believe in being comfortable when I’m at home and I don’t like to sweat … so, if this is going to be my cleaning weekend, I’m putting in the air!! AND … the sooner I get done with my cleaning – I can get to my stamping and play with all the new stuff I have (yes, I’ve still got a BIG Wish List when the catalog comes out next week)! Kathie’s stunning card was created with the Flourish Thinlits Dies and the Softly Falling Embossing Folder … got to love that BigShot!! Kathie gently brought the floral piece around the opening / greeting. Not sure if Kathie used the punch or circle framelits create the circle but it adds a beautiful layer of dimension. The floral piece was also embellished with our pearls and it adds a little more dimension and elegance. Our them was “Cards to show we Care” and this one is beautiful!! This layout would work well for any occasion from Wedding, to announce a new baby to Sympathy. 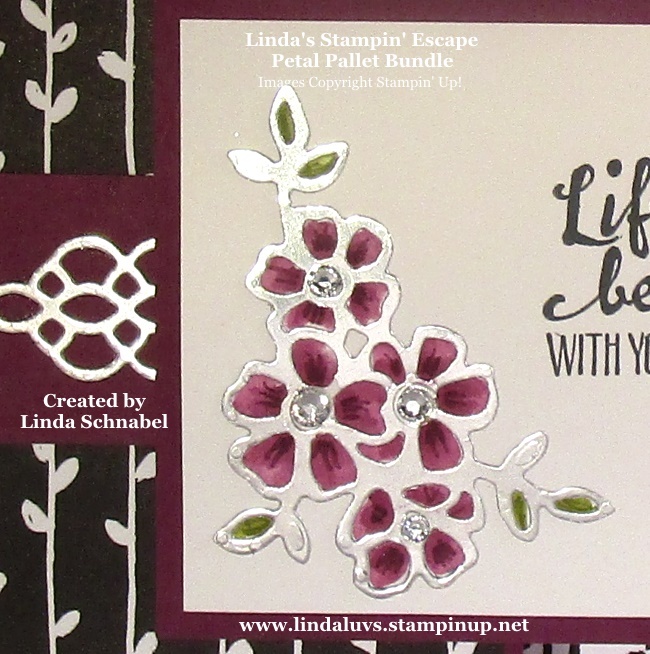 Thank you for joining me today, I hope you enjoyed Kathie’s card as much as we all did at the Stampin’ Retreat…. it is stunning! Have yourself a fabulous day today … and enjoy the holiday weekend. I hope you got to enjoy a wonderful weekend and got spoiled a little! I also hope you got a chance to check out my post yesterday to see the new In-colors. I love these cards and the simplicity yet they were so pretty! 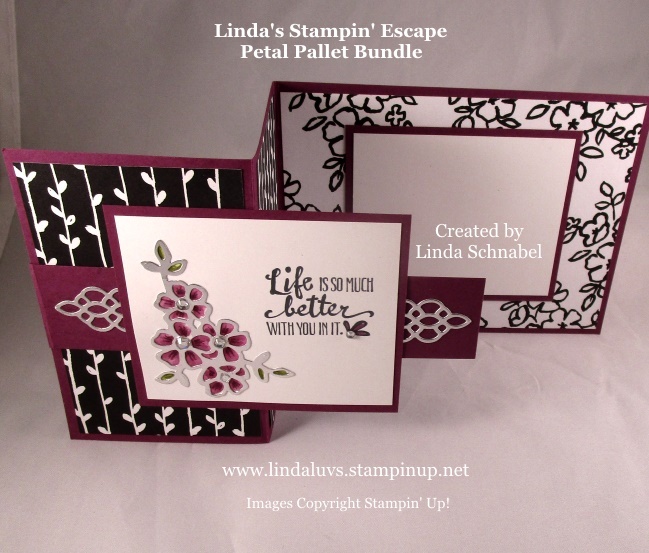 I began with the Petal Pallet bundle and designer series paper. I knew I wanted to use the beautiful floral die in the bundle. I also want a little bit different of a fold … just for fun! Petal Pallet will be in the upcoming catalog but it will no longer be a bundle (Save 10%) after May 31st. We used the Multipurpose adhesive sheets with the Silver Foil sheets and then cut them out with the BigShot! Turns them into stickers … and then we just pressed them onto our card. This made it super simple to watercolor the flowers using ink and Aqua Painters. Then we drew the little lines into the flower petals with the coordinating marker. 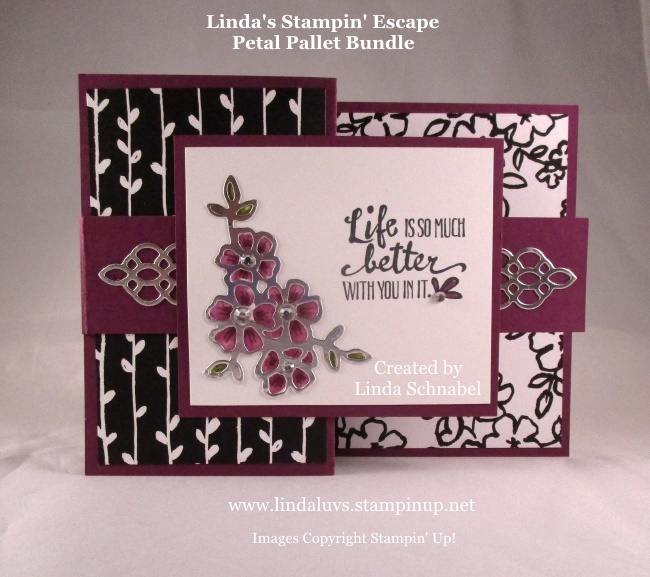 I’ve used the Petal Pallet bundle quite a few times already, it is a very versatile stamp set and I love the coordinating dies. It has great verses / greetings as well … and I will admit, that will sway me towards a stamp set. Sometimes I will choose a stamp set just because of the beautiful verses.